- Publisher -- Includes extensive bibliography.^- Explores multiethnic dimensions of worship^What Are The Universal Constants of Christian worship? What are the unique elements that arise out of diverse local contexts? 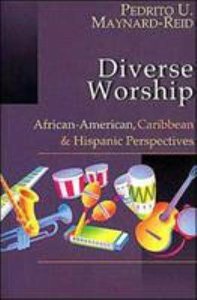 How do we appropriately respect and honor both the constancy and the diversity?^In this book Pedrito Maynard-Reid explores the multiethnic dimensions of worship by looking at three specific cultural contexts for worship -- African-American, Caribbean and Hispanic. After surveying worship and culture through history, the author devotes a section to each of these three cultural contexts. In these sections worship traditions are colorfully described and characterized. Historical development and change is explored. In each section we gain new perspective on what it means to worship God. - Publisher Let the nations sing.What are the universal constants of Christian worship? What are the unique elements that arise out of diverse local contexts? How do we appropriately respect and honor both the constancy and the diversity?InDiverse WorshipPedrito U. Maynard-Reid explores the multiethnic dimensions of worship by looking at three specific cultural contexts--African-American, Caribbean and Hispanic. After surveying worship and culture through history, he devotes a section of his book to each of these three cultural context for worship. Maynard-Reid colorfully describes and characterizes each worship tradition, and he explores its historical development and change.Throughout this engaging and enlightening book, we gain new perspective on what it means to worship God. -- Includes extensive bibliography.^- Explores multiethnic dimensions of worship^What Are The Universal Constants of Christian worship? What are the unique elements that arise out of diverse local contexts? How do we appropriately respect and honor both the constancy and the diversity?^In this book Pedrito Maynard-Reid explores the multiethnic dimensions of worship by looking at three specific cultural contexts for worship -- African-American, Caribbean and Hispanic. After surveying worship and culture through history, the author devotes a section to each of these three cultural contexts. In these sections worship traditions are colorfully described and characterized. Historical development and change is explored. In each section we gain new perspective on what it means to worship God. Let the nations sing.What are the universal constants of Christian worship? What are the unique elements that arise out of diverse local contexts? How do we appropriately respect and honor both the constancy and the diversity?InDiverse WorshipPedrito U. Maynard-Reid explores the multiethnic dimensions of worship by looking at three specific cultural contexts--African-American, Caribbean and Hispanic. After surveying worship and culture through history, he devotes a section of his book to each of these three cultural context for worship. Maynard-Reid colorfully describes and characterizes each worship tradition, and he explores its historical development and change.Throughout this engaging and enlightening book, we gain new perspective on what it means to worship God. 4. "we Had Church Today!"